I’ve tested the Brookstone Shiatsu Neck Massager and, boy, did I like it. Brookstone is a pretty reputable brand in the world of massage products, and this is one of their flagship models. But is it worth the title of best neck massager? I say it does if you’re curious why I’ve analyzed all its features and specifications below. 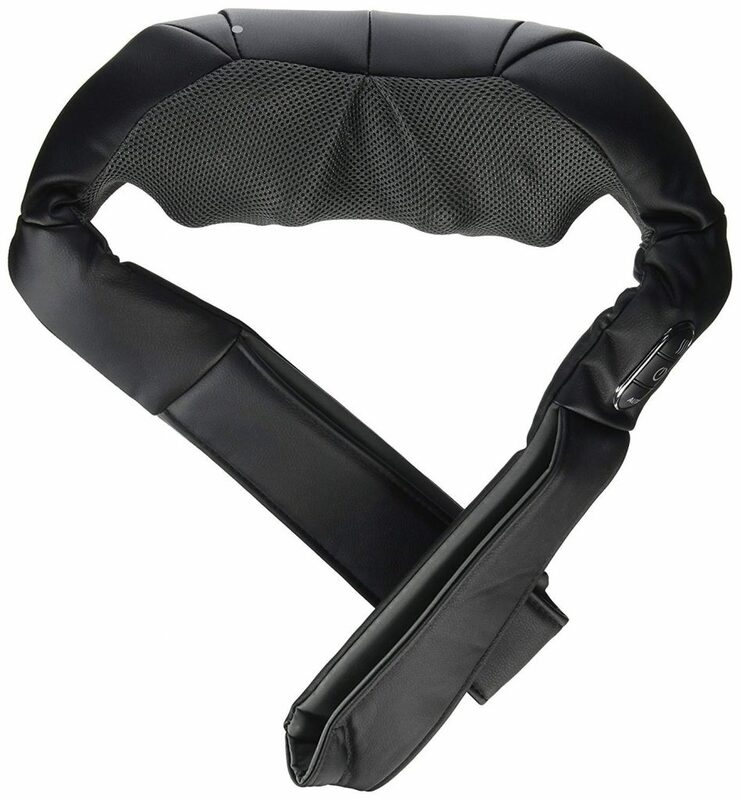 The first thing you’ll notice about the Brookstone neck massager is its stylish design. This device looks and feels great, like a top product. 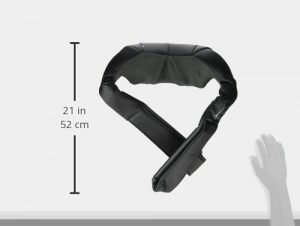 It’s flexible and functional, not to mention stable and comfortable around your neck. Regarding the material, though, online reviewers have different experiences. Some say that the material is sturdy, while others complain that it gets easily ripped. That’s why it’s essential to buy a new product from a trustworthy retailer. Some online vendors might trick people and sell them a used Brookstone massager instead of a new one, which gets damaged faster. Moral of the story: don’t get fooled by a glamorous discount. Another possible disadvantage could be the two arm loops. If you have severe mobility issues – for instance, if you can’t put on a sweater by yourself – it will be difficult to adjust these arm loops by yourself. The Brookstone neck massager is a device you can easily control for added versatility. You can choose to massage different areas on your body, and you can also select the intensity quite precisely. 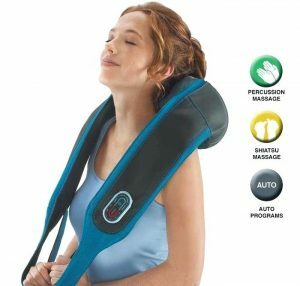 This massager will relieve soreness in your neck muscles, back and even between your shoulder blades – which is a tough nut to crack with most massagers. Pro tip: think outside the box and place this neck massager around your calves for a soothing massage. Reaching all these sore and tight muscles with a machine, without having to visit your chiropractor or massage therapist, is excellent for people with tight schedules. These adjustments are easily made by lifting or lowering the handles to position the massage nodes exactly where you feel soreness or pain. It helps unwind you, so you’re more relaxed and ready to face the daily stress. It’s quite easy to control the Brookstone massager. First, you need to place the machine around your neck. On the left side, you’ll find three buttons for turning the machine on or off, for the heat, and for reversing or locking the Shiatsu nodes. The massage quality of the Brookstone Shiatsu Neck Massager is 5/5. The rolling massage nodes will target your entire back, including the shoulders. They massage muscles efficiently and comprehensively, meaning that you can release tension faster. It’s also great for people who have chronic back pain or neck pain. The vibration seat massage is another stellar addition. You can use this on its own, or together with the other massage functions. Therapeutic vibrations improve blood circulation and alleviate sore muscles, thus reducing overall stress. Plus, there are three intensity levels you can try! 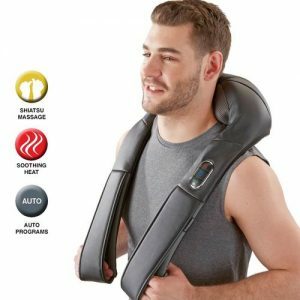 Most shiatsu neck massager reviews emphasize the benefits this Japanese technique has. What you need to know is that Shiatsu uses rotating movements and kneads certain acupressure points so that it can unwind tight muscles. It helps them heal faster, reduces pain, improves heart rate and flexibility, plus it helps with problems like insomnia. This machine is excellent for deep tissue massages thanks to its 8 deep-kneading Shiatsu massage nodes. The 8 Shiatsu nodes target all your sore muscles, relieving tightness. It helps muscles heal faster after you’ve been working out or after you’ve had a hard day at the office. And if you want to increase the pressure, placing your hands into the padded arm loops makes gravity your ally. The heat feature is great, but you can choose to deactivate it if it’s too much for you. While heat helps improve blood circulation and unwinds sore muscles faster, it can also seem a bit itchy to some. 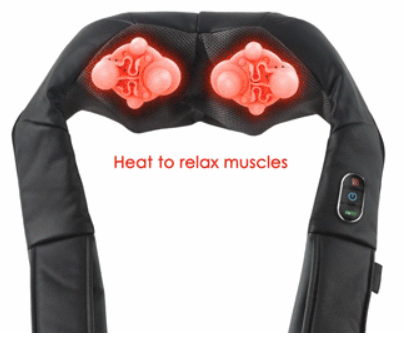 Activating the heat option feels like an actual human massage therapist massages your neck and back. It would have been perfect, though, if users could select the heat’s temperature. There are three auto-programs you can choose from auto-reversing, single direction, and the timed interval. The first two are responsible for adjusting the massage nodes’ movements. You can either have them move in opposite directions or choose a single direction for the rotation. It targets your neck and back muscles in different ways to relieve tension. If you want to get rid of a stubborn knot, choose the auto-reversing function. If you're going to relax faster, choose the single direction program. The timed interval helps you select the massage time. However, the Brookstone massager features a 20-minute auto shut-off, which is great for saving power and preventing accidental heating. The Brookstone customer service is not the best on the market. Some Amazon reviewers complain that their warranties are rejected because they purchased the neck massager from Amazon and not from the Brookstone website. Others complain that even if their warranty is accepted, Brookstone finds some loophole to avoid repairing or replacing faulty products. This massager comes with a 1-year limited warranty against defects in materials and quality. 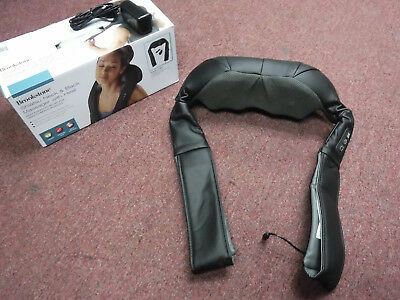 It meansBrookstone can repair or replace your neck massager free of charge, as well as offer store credit. 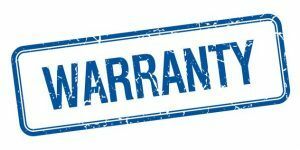 However, they’re pretty strict with their limits and exclusions, so the customers have to respect all the rules to benefit from the warranty. The Brookstone shiatsu neck massager is in the middle range when it comes to weight and volume. 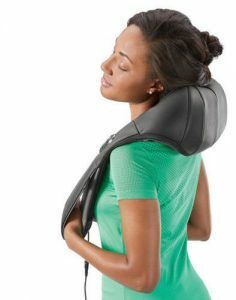 You can easily fit it in a backpack and carry it to work, where you can enjoy a relaxing neck massage in your lunch break. The 10-foot cord has you pretty pinned down, though. You have to find a comfortable place near a wall socket, and you can’t move around the house with the massager on. There’s a wireless version of this neck massager though, for an added cost. The Brookstone neck massager is one of the best neck massagers on the market, though it’s pretty expensive. So, if you don’t have a coupon or the luck to find it at a discount, you can always opt for a more affordable product, such as Nekteck Shiatsu Deep Kneading Massage Pillow Neck Massager. The Nekteck massager has a similar design and most of the same functions, offering a great deep-tissue massage, although it can be a bit much for casual users. However, the controls are a bit difficult to reach, and you can barely feel the heat. That said, remember that Brookstone is overall a better option and that sometimes it’s worth investing more in a quality, durable product with all the bells and whistles.